Bill Cosby has apparently lost his first appeal to see his conviction overturned. According to CBC, the judge presiding rendered their decision on Tuesday after careful consideration into the matter, causing Cosby's wife Camille to again, accuse the judge of malpractice & bias against her spouse. Cosby's wife believes a confrontation with a pivotal pre-trial witness may have swung things out of favor. Cosby's defense team wants their client released on bail while he files the multiple court injunctions against the judge's presumptive "bias." The 81-year old is currently facing three to ten years in a state penitentiary for sexually molesting a woman in 2004. 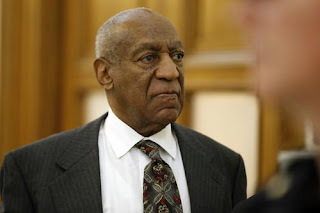 Bill Cosby has reportedly been given a single cell to himself, as well as access to a "dayroom" where he can watch television and eat his meals, somewhat removed from the anguish of regular prison life. Due to his legal blindness, several inmates have been assigned to help him complete his daily work assignments. The next step for Cosby if he hopes to overturn his conviction would be to file the same complaint in a Superior State Court, although there is a strong chance nothing will come of it. The defense also filed complaints against the following three incidents in the trial, in concurrence with the motion to overturn his conviction. 1. "Let five other accusers testify." 2. "Let the jury hear portions of Cosby's damaging deposition in the accuser's related lawsuit." 3. "Declare Cosby a sexually violent predator who remained a threat to the community." The Cosby saga is nowhere near finished.